A boy aged just eight has been banished from a Chinese village - because he was found to be HIV-positive. The youngster's own grandfather was among 200 people in the community, in China's southwestern Sichuan province, who signed a petition to expel the child to 'protect villagers' health'. It has been reported that the boy - who was given the pseudonym Kunkun by Chinese media - contracted the virus from his mother. The case, reported in the Global Times newspaper, has highlighted the stigma attached to the disease in China, where many sufferers face widespread discrimination. Previous reports said the boy was refused admission to local schools and villagers would avoid contact with him. 'Nobody plays (with me), I play alone,' Kunkun said, according to a report on the website of the People's Daily newspaper. The website also said Kunkun was referred to as a 'time bomb' in the petition. 'The villagers sympathise with him, he is innocent, and only a small child. But his AIDS is too scary for us,' Wang Yishu, party chief of Shufangya village, told the website. The boy's mother reportedly left the family in 2006, while his father 'lost contact' after Kunkun's condition was diagnosed. Kunkun sneaked into a specially-convened meeting held earlier this month by villagers to discuss how they would banish him, it has been claimed. High ranking officials from the township government said 'legally speaking' the boy could not be expelled, and that he has the same rights as other villagers, the Global News said. Officials plan to visit the village and speak with the villagers', it added, while the People's Daily website said 'ideological work' would be carried out in the village. It was unclear last night whether Kunkun was still in his village. The case has sparked debate on China's Twitter-like Sina Weibo, where it was the most widely-discussed topic early on Thursday. 'Why was he ruthlessly neglected, it is so unfair to him,' said a post by one user. 'This is because the Chinese population cannot get enough education, causing ignorance and panic,' said another. 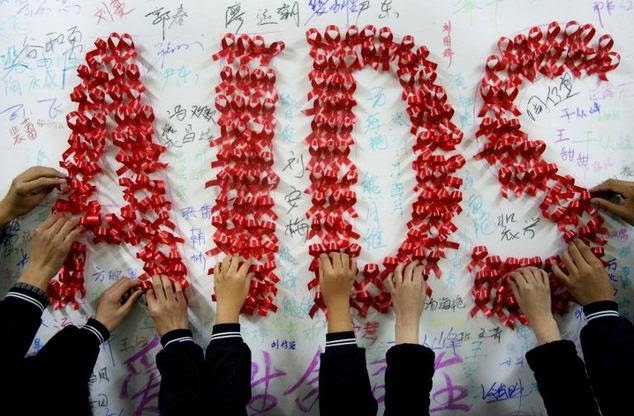 Figures released earlier this month by China's National Health and Family Planning Commission showed that a total of 497,000 people in China have been diagnosed with HIV/AIDS since the country's first case in 1985. China has a population of 1.36billion. Discrimination against those with the virus remains an issue at schools, hospitals, workplaces and other establishments across the country, a factor that experts say hampers efforts to diagnose and treat it. Knowledge of HIV/AIDS is worse in poor, rural areas, such as the community Kunkun is from, experts say. Attempts by authorities to educate these populations about discrimination often fail, a campaigner who would only give his surname as Tang told AFP. 'The publicity campaign is not strong enough to reach the rural areas and villages and that's why there is more discrimination there,' said Tang, a community coordinator at the Kunming office of AIDS advocacy group Aizhixing. 'Personally I don't think such situations would exist in cities,' Tang added. 'People in rural areas know little about civil rights and they have a poor sense of the disease. 'We will continue using our network to speak out, meanwhile we hope the government could do more as well. 'The Nanjing-based anti-discrimination NGO Justice for All wrote a letter to party chiefs in Sichuan calling on them to punish school chiefs and local officials for their 'Cultural Revolution style', a reference to the Mao Zedong-inspired public denunciations of 'foes'. 'We cannot imagine how Kunkun will grow up and look back on the experience of childhood,' said a draft of the letter, which was emailed to AFP on Thursday.